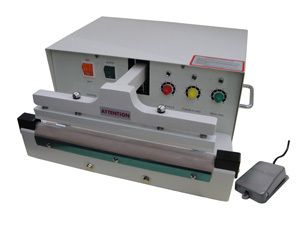 Automatic sealers 12" to 32" wide are designed for the continuous and repeated sealing of thermoplastic materials. 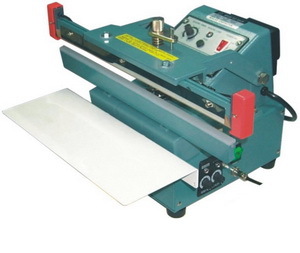 Automatic sealers 12" to 32" wide are designed for the continuous and repeated sealing of thermoplastic materials. Depending on the model of the sealer, material up to 32" wide and 8 mil thick (16 mil total) can be sealed. Our double impulse sealers for material up to 20 mil per side. The seal widths are 2mm to 10mm. They are equipped with an electronic timer and an electromagnet for opening and closing. They operate on impulse sealing; controlled by a plug-in transistorized circuit board. Auto sealers have programmable timers for heating, congealing and recycling cycle that, once set, will give you consistent seals automatically. Use the wider seal widths for the more robust liquid tight seals needed for food products. Impulse sealers fire a short impulse of electricity through a specially designed heating element to seal the open end of bags. The length of the seal time will depend on the type and thickness of the bag being sealed as well as the type of sealer. Our sealers seal poly bags and any thermoplastic material such as polyethylene (PE) and polypropylene (PP) quickly and efficiently. Other materials also may be sealed. No warm up time is needed.